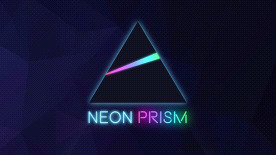 Neon prism is a fun and simple but at the same time highly addictive game. The goal of the game is to drive your little ship from one end to another, dodging numerous obstacles, solving puzzles, opening new passages with checkpoints and discovering unique game mechanics by yourself. There are 50 levels, and there is also a cool medal system so you can always try your best for that shiny gold medal. Enjoy the uplifting music, breath taking visuals, solve puzzles, don't be afraid to fail, the game might be a bit tricky towards the end, but everyone can master it.